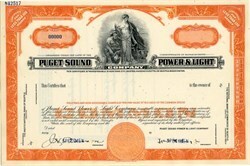 Beautiful engraved specimen from the Puget Sound Power & Light Company printed in 1950. 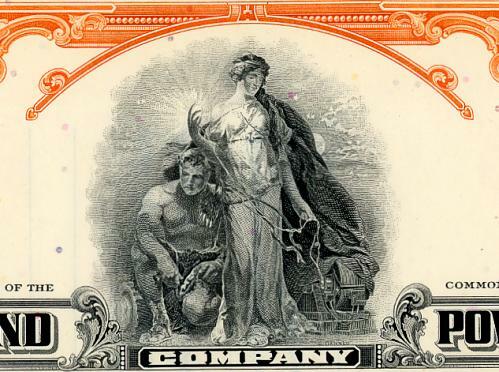 This historic document was printed by the American Banknote Company and has an ornate border around it with a vignette of an allegorical man and woman. This item has the printed signatures of the Company’s President and Treasurer and is over 56 years old. In February of 1997, Washington Energy Company, Washington Natural Gas Company and Puget Sound Power & Light Company merged together to become the Puget Sound Energy Company.